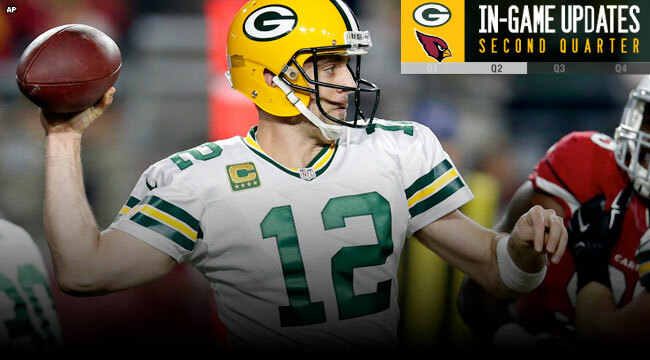 GLENDALE, Ariz. — Two time-consuming drives that used up at least 7 1/2 minutes each produced a pair of field goals for the Packers as they entered halftime trailing the Cardinals, 7-6, in an NFC divisional playoff game on Saturday night at University of Phoenix Stadium. The second quarter began with all kinds of action, right after Packers WR Randall Cobb was carted to the locker room with a chest injury. Cobb was injured on his one-handed diving catch that was wiped out due to offsetting penalties late in the first quarter. He was later ruled out for the game, leaving the Packers with just three wide receivers to play with. The Packers then drove for a field goal to get within 7-3. QB Aaron Rodgers converted on third-and-4 with a 19-yard scramble, and then he found WR Jared Abbrederis for 14 and 17 yards to convert two more third downs. An 11-yard pass to WR Jeff Janis got the Packers into the red zone before a wild play. On third down, Rodgers scrambled and threw to the end zone, but it was intercepted by CB Patrick Peterson, who returned it all the way for an apparent Cardinals TD. But Arizona’s Frostee Rucker was penalized for illegal hands to the face on his pass rush vs. Bryan Bulaga, and the turnover was wiped out. The Packers’ drive still stalled, though, and K Mason Crosby was good on a 28-yard FG with 11:22 left in the half. The drive was 17 plays and took 7:31 off the clock. A sack by Julius Peppers helped get the ball back right away, and the offense got back to work. Third-down passes of 11 yards to TE Richard Rodgers, 18 yards to Abbrederis and six yards to Janis got the Packers into scoring range. Janis caught a 13-yarder along the sideline for another first down in the red zone. The Packers could go no further, though, and Crosby made a 34-yard FG to get the Packers within 7-6 with 57 seconds left in the half. It was another 17-play drive, this one consuming 7:55. Mike Daniels got the defense’s third sack of the half on Arizona’s next possession, and the Cardinals ran the clock out.